The Linksys WAP300N is a dual-band Wireless-N Access Point that can be configured to work as a range extender. This functionality of the device will allow you to extend the range of your existing wireless network and eliminate dead spots in the area. To configure the Linksys WAP300N as a wireless range extender, follow the steps below. Access the Linksys WAP300N’s web-based setup page. For instructions, click here. If you are using a Mac® computer to access the web-based setup page, click here. On the Setup page, click the Operation Mode sub-tab. 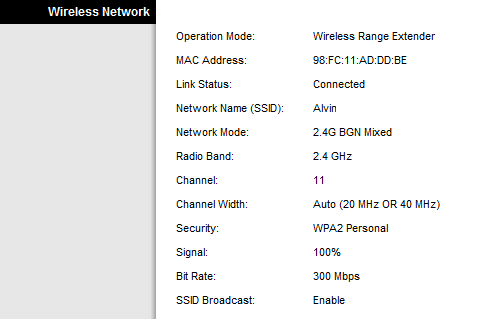 Click Wireless Range Extender, then click Save Settings. Wait for the Operation Mode change progress bar to finish. You will be directed to the Setup page once the change is applied. 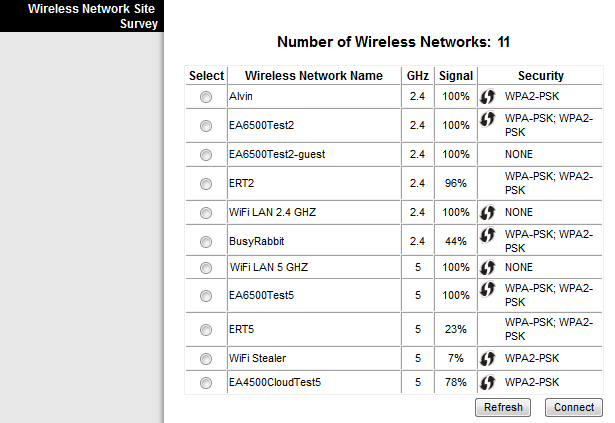 The Wireless Network Site Survey feature on the Linksys WAP300N's web-based setup page scans for wireless networks within range. You can use this option to easily identify your router and connect to it. The steps below will guide you on how to use the site survey feature of your Linksys WAP300N. On the Setup page, go to the Wireless tab and click Wireless Network Site Survey. NOTE: If the network supports Wi-Fi Protected Setup™ (WPS), the WPS icon appears next to the security method. NOTE: Click the Refresh button to update the on-screen information. Click the radio button next to the SSID of your wireless network. Enter the wireless password in the Passphrase field then click Connect. NOTE: The Passphrase is the wireless password of the network you selected. NOTE: The Linksys WAP300N will reboot after applying these settings. Refresh the page, then go to Status and click Wireless Network. The Link Status indicates whether or not you are successfully connected to the network.